If heifers have not reached puberty and cycled before the breeding season, they may be set up for failure as 2 year olds, cautioned David Patterson, professor of animal science and beef extension specialist for the University of Missouri–Columbia. During an Angus University educational breakout session at the 2017 Angus Convention in Fort Worth, Texas, Patterson explained to producers the importance of selecting fertile heifers. Weight alone cannot determine if a heifer has reached puberty and is ready to be bred, he emphasized. While age and weight at puberty are heritable traits that have proven to be consistent over time, there are other things to look at before making the assumption a heifer is ready to breed. 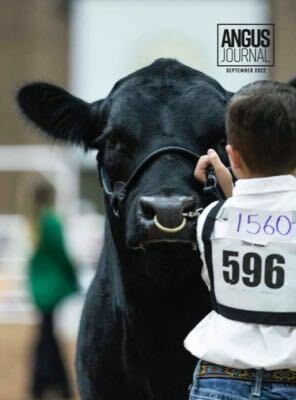 The beef industry as a whole is not fully utilizing a lot of the fairly basic tools available to improve reproduction by properly selecting, developing and managing replacement females, Patterson observed. There’s technology sitting on the shelf that could and should be implemented. Cattle producers are charged with managing resources and other factors contributing to how efficiently their operations are managed. The bottom line is the management has to end with profit, and how one juggles all the various considerations can maximize that profit. Reproductive Tract Scores (RTS) are one the best predictors of fertility, Patterson said. It has been shown that age has a stronger effect on RTS than body weight or body condition score (BCS). Heifers should score an RTS of 4 or 5 before breeding, and they should ideally be on their third estrus. Patterson presented research showing that heifers exposed for breeding on their pubertal estrus are about 21% less likely to get pregnant than those bred on their third estrus. You’d like to have the bulk of heifers cycling at the start of the breeding season as opposed to reaching puberty at some point during the breeding season. The age and weight at puberty are much more highly heritable than any other reproductive traits. If we look at data from the American Angus Association relative to heritabilities and look at those relationships in a ranking, said Patterson, scrotal circumference (SC) and birth weight (BW) are the most highly heritable, but heifer pregnancy (HP), which is used fairly extensively, is relatively low. While the HP EPD ranks fifth in heritability among reproductive traits within the breed, it is one that should not be overlooked, said Patterson. Angus producers should strive to collect more and better reproductive data to strengthen EPDs such as HP. In a group of 100 heifers by the same sire, a simple 5% difference in HP versus another sire group means five more pregnant heifers on the first breeding. Most heifers that calve early in the herd and continue that calving pattern typically go on to wean heavier calves. The percent of cows that wean those calves is also a highly important consideration. When one looks at where losses occur in the industry, the largest loss occurs as a result of cows failing to become pregnant, Patterson explained. When one considers the reproductive cycle of beef cattle in general, success is highly influenced by growth and development. Heifers that aren’t ready to be bred at the start of the breeding season fall behind and calve later than the rest, Patterson said. As a result, they are set up to fail as 2 year olds when it’s time to re-breed.